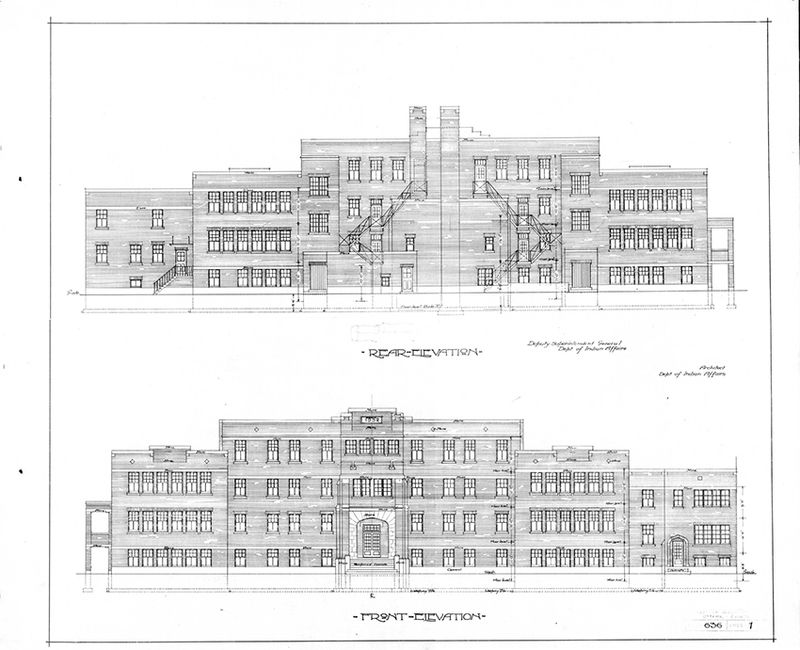 These drawings, which date from the beginning of the twentieth century to the 1980s, demonstrate the ways in which the government used architecture as a significant tool to enact its racist policies, constructing entire built worlds—the notorious residential schools where indigenous children were taken to be assimilated into mainstream Canadian society, as well as on-reserve day schools, houses, churches, council-houses, jails, hospitals and farm buildings. The documentary remnants of these projects, built and unbuilt, locate these building typologies within the colonial agenda: whether carried out on the reserves to displace traditional ways of living on the land, or off the reserves, in the case of residential schools that were intended to indoctrinate children into Euro-Canadian customs. Three years after the Indian Act was passed, Canada’s first prime minister, Sir John A. MacDonald, engaged Nicholas Flood Davin, an English journalist, to investigate boarding schools for indigenous children in the United States as a possible model for assimilation in Canada. Based on his visit, Davin, who later became a member of parliament, advised that a federally funded system of industrial schools should be established throughout the country.5 He reported that in the USA, “the industrial school is the principal feature of the policy known as ‘aggressive civilization’” and was preferred over the establishment of day schools on reserves as “the influence of the wigwam was stronger than the influence of the school.”6 This culturally imperialistic architectural metaphor—in which the wigwam stood in for indigenous culture and the school for settler culture—reinforced a certain association between “civilization” and the built environment. It revealed the true aim of these schools, in both the US and Canada, as the separation of indigenous children from their families in order to prevent the perpetuation of traditions, leading to the eventual elimination of indigenous cultures. This cultural separation was maintained by the location of the schools, which were mostly off reserve and often several days’ travel away from the children’s communities. 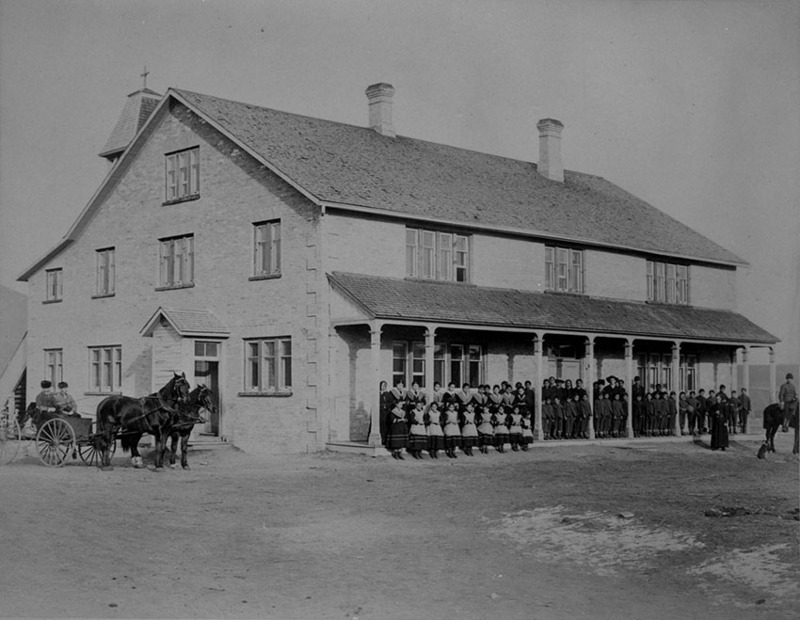 Students, nuns and priests posing in front of St. Joseph’s Indian Industrial School, High River, Alberta, 1896. Source: Library and Archives Canada, David Ewens Collection, e006610127. Only after federal funding of schools began in 1880 do the first records of architects employed by Indian Affairs appear. In 1881, a firm called Paul & Son was engaged to work on a new school house for the Mississaugas of Alnwick, Ontario and in 1886, a government architect identified only as Mr. Henderson designed several small structures at the Roman Catholic St. Joseph Industrial School in High River, Alberta. 11 The smaller on-reserve day schools, which were attended by children who continued to live at home, were often one- or two-classroom buildings similar to typical settler schoolhouses. These were constructed by Indian Affairs, as were residential or boarding schools, which were similar to the earlier off-reserve missionary schools. Some larger industrial schools, including St. Paul’s in Manitoba (also known as Rupert’s Land Industrial School) or the Regina Indian Industrial School in Saskatchewan, were built by the Department of Public Works—the governmental branch responsible for federal architecture at large.12 These various school typologies were the beginning of direct federal involvement in building for indigenous peoples, leading to a more centralized system of architectural production that supplanted the more informal processes of the missionaries. This change indicated Canada’s growing involvement in both religious conversion and secular “civilization,” aimed at completely assimilating indigenous peoples into mainstream Canadian settler society. 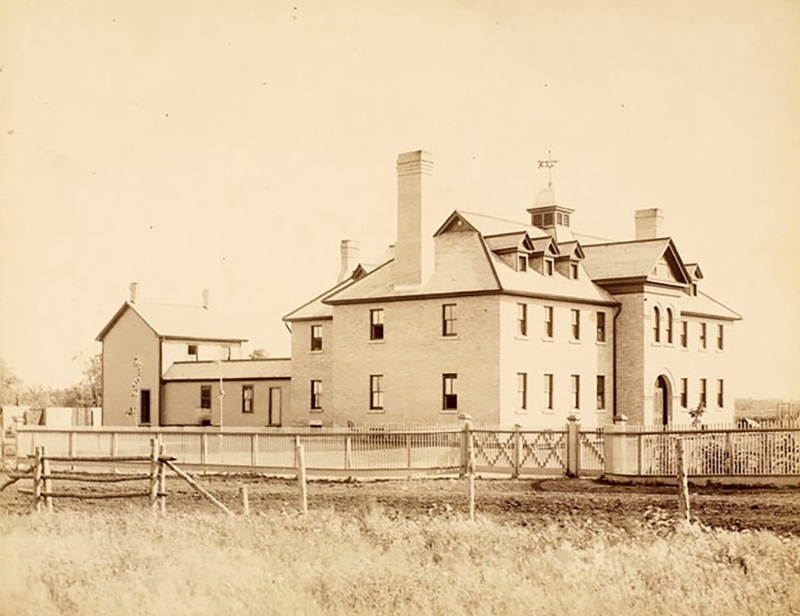 Architectural view of St. Paul’s (Rupert’s Land) Indian Industrial School ca. 1890. Source: Library and Archives Canada, David Ewens Collection, e006610115. The second generation of Indian schools developed by the federal government in the twentieth century were institutional—with large, open dormitories on the upper floors and often a chapel or assembly hall comprising a back wing. The shifting purpose of the schools, from assimilation based on industrial training in trades to a program of segregation and cultural decimation, is reflected in both the architectural evolution of these institutions and their educational models.13 The newer schools focused on delivering a basic curriculum with a half-day of manual labour to defray operational costs, but little effort on the part of government, churches, or the (often-underqualified) teachers to impart useful skills or aid in academic success. The schools continued to be operated by the churches, and the religious program remained a strong element of residential school life. Having spent years away from home in a state of cultural confusion, returning to their communities only in the summer, many of the graduates were left prepared for neither a “traditional” way of life on the reserve nor to become functional in mainstream Canadian society. This pattern of cultural disrespect and separation of children from their families has often been noted by survivors of these institutions as their most harmful practices, leading to the intergenerational trauma still experienced by indigenous communities. 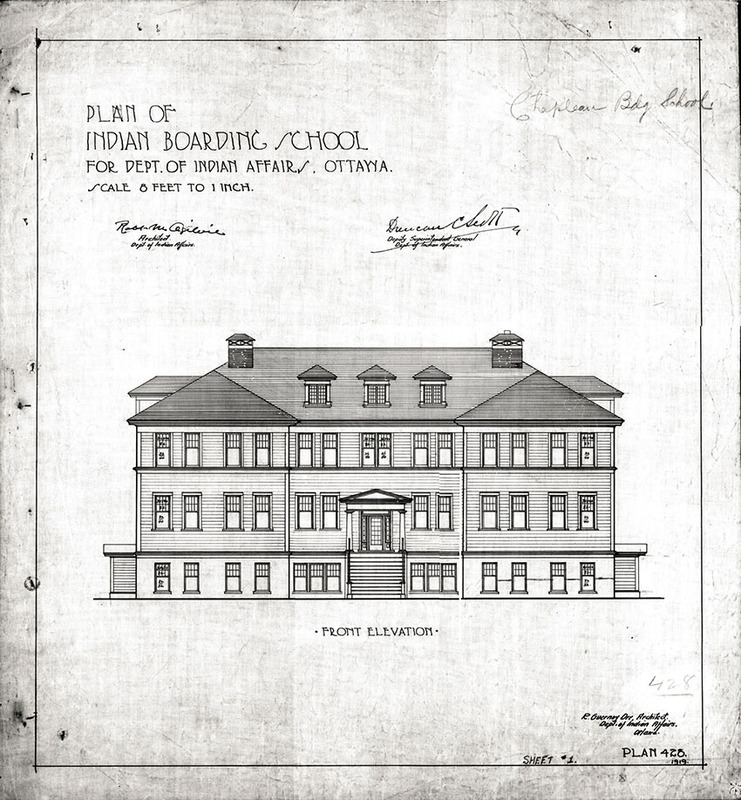 An elevation of a generic “Indian Boarding School” from 1919, designed by Indian Affairs architects R.M. Ogilvie and R.G. Orr. The design was later earmarked for Chapleau, Ontario, according to ephemera in the upper-right corner. © Government of Canada. Reproduced with the permission of Library and Archives Canada (2015). Source: Library and Archives Canada/Department of Indian Affairs and Northern Development fonds, Item # 302-311. As government policy focused on cultural annihilation rather than assimilation into settler society, Indian Affairs expanded their architectural work beyond the schools to include new houses, churches, council-houses and jails, altering the built landscapes of reserves themselves. Repeatable housing designs for those living on reserves, as well as specific designs for temporary inhabitants like schoolteachers, translators and Indian agents (representatives of the federal government) demonstrated the extent to which the Canadian government enforced its policies through the built environment (Figures 04-05). These buildings served as markers or symbols of Euro-Canadian dominance on the reserve—actively transforming the population into productive participants in the settler economy while folding them into European notions of domesticity and forms of justice. 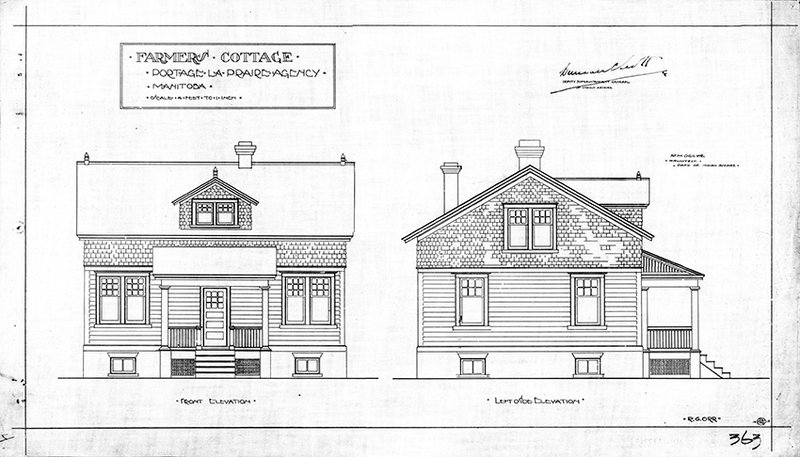 Design for a farmer’s cottage intended to be built on reserves in the Portage la Prairie Agency in Manitoba 1915. Drawn by R.G. Orr under the supervision of Chief Architect R.M. Ogilvie. © Government of Canada. Reproduced with the permission of Library and Archives Canada (2015). Source: Library and Archives Canada, Department of Indian Affairs and Northern Development fonds, NMC177717. Design for a farmer’s cottage intended to be built on reserves in the Portage la Prairie Agency in Manitoba 1915. Drawn by R.G. Orr under the supervision of Chief Architect R.M. Ogilvie. © Government of Canada. Reproduced with the permission of Library and Archives Canada (2015). Source: Library and Archives Canada, Department of Indian Affairs and Northern Development fonds, NMC177718. The projects that Roland Guerney Orr completed under Ogilvie drew on the neoclassical vocabulary (Figures 03-05), consistent with prevailing trends in North American institutional and residential architecture in the first decades of the twentieth century. However, once Orr became Chief Architect, he shifted away from the aesthetics and historical symbolism of neoclassicism to the Collegiate Gothic style popularly used in colleges and high schools in the United States and Canada. Later, in the 1930s, he embraced a version of Classical Moderne or PWA Moderne, as it was commonly known in the United States (in reference to the Public Works Administration) (Figures 06-07).15 The influence of new European and American architectural styles served as an extension of the symbolic capital contained in earlier architecture produced by the Department of Indian Affairs—ever-present reminders of state power and the dominance of Western culture over indigenous populations. Design for the new Shingwauk Indian Residential School in Sault Ste. Marie, Ontario that underwent a significant change during a two-year hiatus brought on by the Depression. The original drawings by R.G. Orr from 1932 reveal a Classical Moderne design similar to other schools built around 1930. A second version of the design from 1934 (constructed in 1935), depicts a Collegiate Gothic design akin to Orr’s earlier work from the 1920s. © Government of Canada. Reproduced with the permission of Library and Archives Canada (2015). Source: Library and Archives Canada/Department of Indian Affairs and Northern Development fonds, 1211-1268. 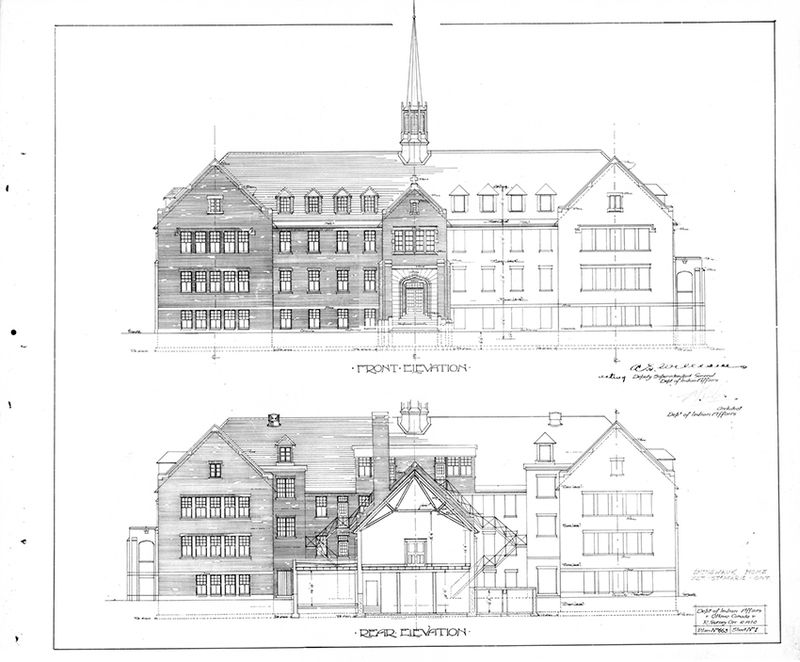 Design for the new Shingwauk Indian Residential School in Sault Ste. Marie, Ontario that underwent a significant change during a two-year hiatus brought on by the Depression. The original drawings by R.G. 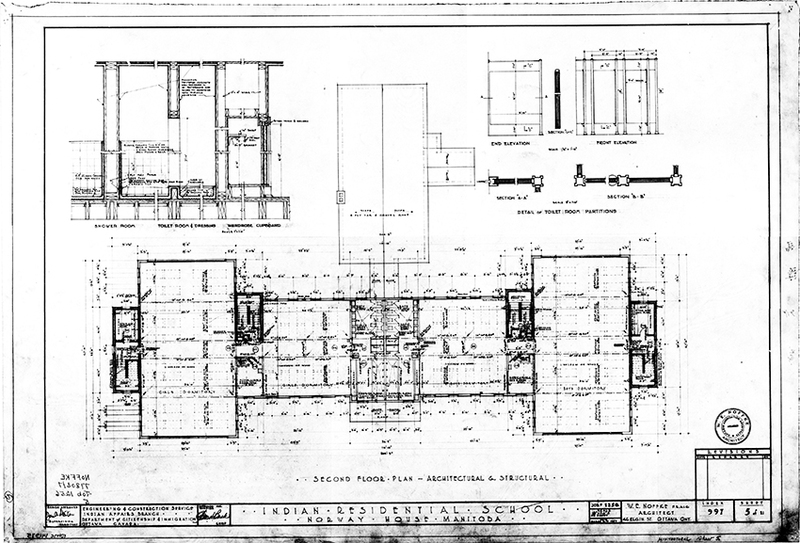 Orr from 1932 reveal a Classical Moderne design similar to other schools built around 1930. A second version of the design from 1934 (constructed in 1935), depicts a Collegiate Gothic design akin to Orr’s earlier work from the 1920s. © Government of Canada. Reproduced with the permission of Library and Archives Canada (2015). Source: Library and Archives Canada/Department of Indian Affairs and Northern Development fonds, 1256-1268. The continued expansion of residential schools after WWII occurred in the context of shifting Indigenous-Canadian relations. For the first time, the government consulted with First Nations regarding proposed changes to the Indian Act and, in 1951, removed the more extreme political, cultural and religious restrictions, like the prohibition of the Sun Dance and potlatch tradition. These reforms were, however, also accompanied by new restrictions on women, including the loss of Indian status when marrying a non-status man, the prohibition of alcohol and the extension of provincial laws to reserves. Photograph of the Indian Residential School at Norway House, Manitoba, in 1954. Archives of Manitoba, Reifschneider, John 133, N25919. 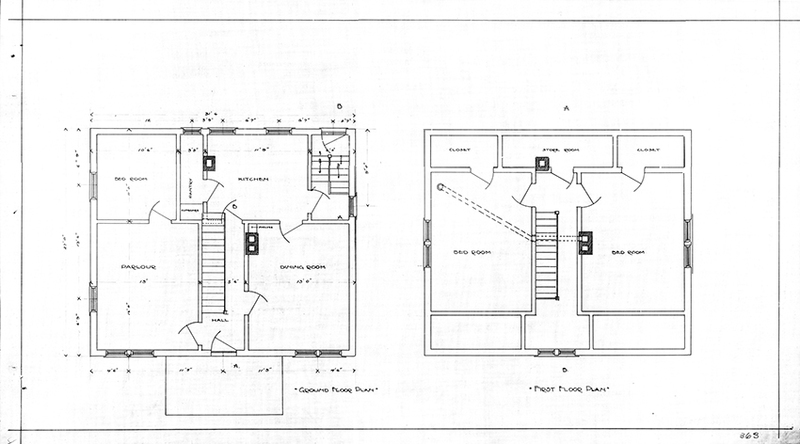 Second floor plan of the Indian Residential School at Norway House, Manitoba, designed by architect W.E. Noffke in 1952. At the time of this design, Indian Affairs was, ironically, the concern of the Department of Citizenship and Immigration.© Government of Canada. Reproduced with the permission of Library and Archives Canada (2015). Source: Library and Archives Canada/Department of Indian Affairs and Northern Development fonds, 997. In typical practice, instruments of service are retained for a number of years, often for litigation protection and legacy creation.18 Within the government’s architectural production, their retention may serve the additional purpose of revealing acts of material significance executed during periods of systemic oppression. As typically understood, service is associated with help or assistance; in the practice of architecture, architects use instruments to assist clients in realizing projects. How does one define service within architecture that furthers colonization? What does “service” mean when it is used in an attempt to erase entire cultural groups from the landscape of a nation? Very little of the catalogued material has been digitized. Instead, most of the documents are copies, duplicated on microfiche and held in tiny drawers on the top floor of the LAC building in Ottawa. Original drawing sets are retained in a facility across the river in Gatineau, Quebec, as well as at three federal regional service centres spread across the country in Dartmouth, Nova Scotia; Winnipeg, Manitoba; and Vancouver, British Columbia. 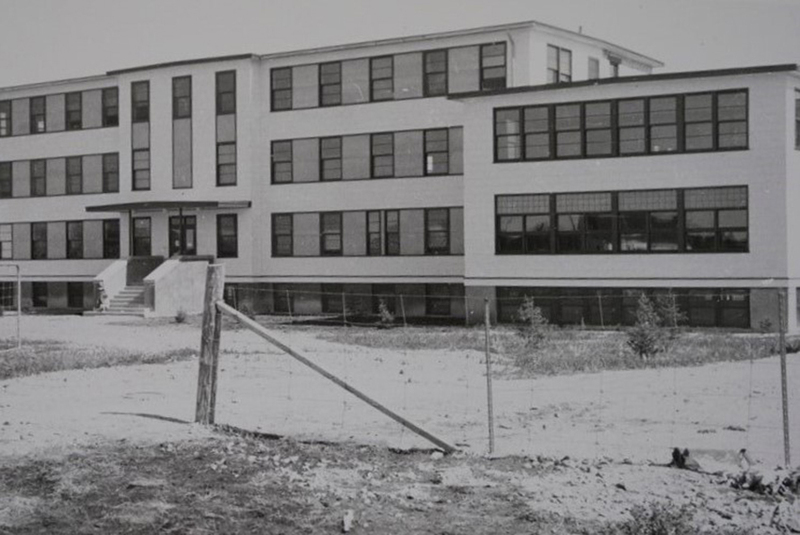 The Mackay Indian Residential School in Dauphin, Manitoba, was designed in 1955 under C.H. Buck as Chief Architect. An assistant principal’s residence, staff quarters, and garage were also built on the site in a similar style and remain standing today. The buildings are used by a religious organization as a food bank, clothes store, and lower-income housing. © Government of Canada. Reproduced with the permission of Library and Archives Canada (2015). Source: Library and Archives Canada/Department of Indian Affairs and Northern Development fonds, 3461-3486. The LAC archive transforms instruments of service into instruments of evidence, demonstrating for whom—or to whom—a service was rendered. In practice, instruments of service constitute the architect’s “product” and are treated as tools in the construction of a building. As evidence, they become tools of a different sort. Through their scrutiny within a broader context, we can further the understanding of the totalizing political landscape of the Indian Act and the Canadian government’s difficult history with indigenous peoples leading to the present moment. In the words of Jacques Derrida, “the archive should call into question the coming of the future.”21 This understanding of the archive necessitates an interrogation of what is yet to come more than a straightforward inquiry into the past. As the settler state of Canada examines its problematic relationship with indigenous peoples, what role can these archived instruments of service play in negotiating the future? How does the archive help account for the architect’s responsibility in carrying out systemic policies of racism and assimilation? Magdalena Miłosz is a Polish-Canadian writer and intern architect based in Kitchener, Ontario. She graduated with a Master of Architecture from the University of Waterloo in 2015 and will be commencing a PhD at the McGill University School of Architecture this fall. 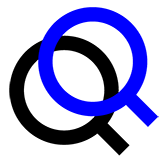 Magda was the winner of the 2015 C New Critics Competition and also received a mention in the 2016 MAQ Young Critic in Architecture Competition. 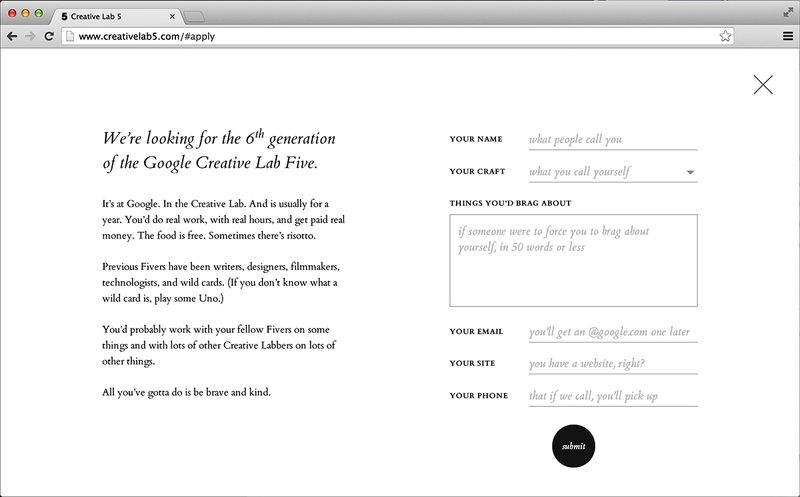 Her texts have previously appeared in Canadian Architect, C Magazine, Scapegoat, and several other publications. She can be found online at www.magdalenamilosz.com. The above essay was recently awarded the 2016 Martin Eli Weil Prize from the Society for the Study of Architecture in Canada. Parts of it are based on a master’s thesis completed under the guidance of Professor Andrew Levitt, Dr. Robert Jan van Pelt, and Dr. William Woodworth, as well as Paula Whitlow, Director of the Woodland Cultural Centre in Brantford, Ontario, as external reader.